Transform your wardrobe into a fashionista’s one with customised apparel from Studio Krian – from wedding outfits to office wear. Haven’t we all wished for a tailoring boutique that will let our wardrobe be as versatile as we dream? Well, that is what this quaint little Boutique in Koramangala is all about. The owner and designer, Rinki helps you transform your fabrics into whatever you choose. 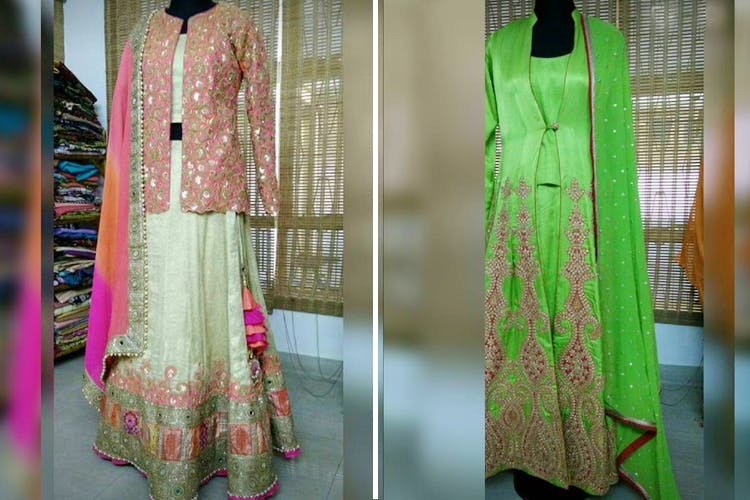 From wedding trousseau to chic linen dresses or silk gowns, semi formals or work wear too, you can get anything and everything designed and stitched here. Rinki can customise designs based on your preferences and budget. There is a range of stuff she specialises in. Her ethnic range includes lehengas, shararas, blouses, salwar kameez, kurtas and anything else you like. Plus, designer saris. She also does very different Indo-Western gowns that you can glide around in at the next cocktail party or at your BFFs engagement. Since palazzos and offbeat trousers are in, go ahead and create your dream pair here. For those who prefer western clothes, this boutique has you covered. From dresses and tops to skirts and jumpsuits, get the red carpet look you want. Oh, plus ethnic wear for kids. Find that pretty fabric in your wardrobe that was bought aeons ago but never got tailored. If you don’t have fabric in hand but a picture on your phone, don’t worry about sourcing the fabric, just call Rinki and set an appointment and take it from there. They also have a range of prints and designs like kalamkaris and ikkats for dresses or kurtas. And if you want some bling, the in-house embroidery unit ensures you get that edgy design, no one else will have. Krian is known for taking old ethnic wear and transforming it into a new outfit altogether. And it’s not just saris. They even make anarkalis into lehenga cholis or old lehengas into anarkalis.